It’s a question we writers seem to be obsessed with. It turns up on countless websites, forums and in many of our author interviews over at The Joined Up Writing Podcast. In case you somehow missed it, a ‘Pantser’ is someone who writes without any real plan – by the seat of their pants – and a ‘Plotter’, well, guess what? They like to plot everything in detail and have a clear road map of where they’re going. My innate impatience and lack of organisation probably means I’m naturally inclined to wing it – just start writing and hope for the best – but over the years I have come to realise I do need some kind of idea of where I’m going. I’ve talked in previous posts about my experience with Nanowrimo. The first sixty thousand words flowed consistently because I had spent the last week of October writing a chapter plan. This was really only a skeleton outline that consisted of nothing more than one or two sentences of what I wanted to happen in each chapter. Once I got going, I got complacent. This novel-writing lark is easy, I thought, as I hurtled towards the end of my chapter plan. A week later I ran out of track, at which point the writing became a lot more tricky. Hmm. Ok. Never one to miss out on a learning opportunity, I bought a couple of books on outlining and decided that my next novel would be PROPERLY OUTLINED. Real, detailed, three act-type stuff. Character notes, beat sheets, back stories, the lot. I spent months plotting a novel about ‘The secret KGB past of misanthropic Russian psychic, Tsurly Guiger, catches up with him when plucky aspiring journalist, Alyson Peabody discovers him hiding in Leicester.’ (Yes, I just used the logline technique mentioned in my last post!). It’s a novel I still intend to write but, for me, spending that long trying to plot the story without writing more than the first two chapters almost killed my enthusiasm for the story. The characters needed at least a few chapters to come to life on the page, to find their feet, so that I could run with their story. So . . . pure ‘pantsing’ doesn’t work for me and I can’t spend weeks and months plotting. What’s a man to do? Like all writing advice . . . you have to find what works for you. My current crime novel is a product of my new approach – ‘Plantsing’. Sounds like you just took ‘Pantsing’ and ‘Plot’ and awkwardly glued them together. Yes, that’s right – deal with it. Anyway, here’s how it’s been working for me. You may recall this project originally started life as a short story. Then a novella, until finally it grew legs and I knew there was a book in it. 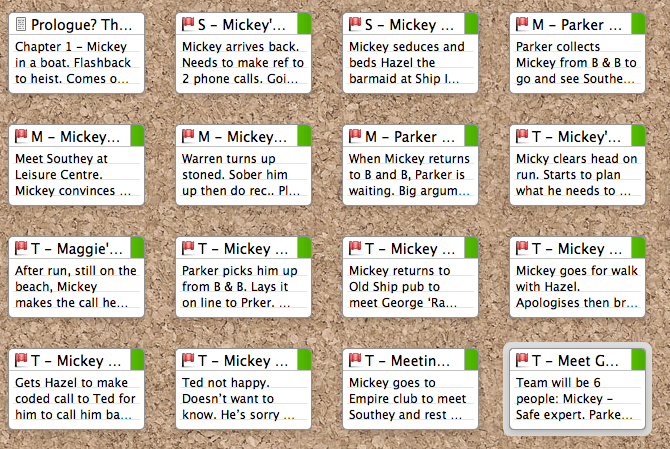 The first few chapters flowed easily as my protagonist, Mickey, drove the plot with his singular personality and wit. However, once I knew the story was opening out in to something much longer, I realised I had to make sure that every time I sat down to work (my morning ritual, of which I’ll write about in another post) I had a good idea of what to write. My solution was to use the power of Scrivener and create a few chapters in my binder. Then write at least a couple of sentences on their index cards (like the ones you can see below). I have tried to make sure that I always have at least four chapters ‘planned’ ahead in this way. EDIT: As pointed out by Misa Buckley on Twitter – you may want to work like this and have no wish to use Scrivener. It’s perfectly possible to do the same thing using your preferred software and usual outlining methods. 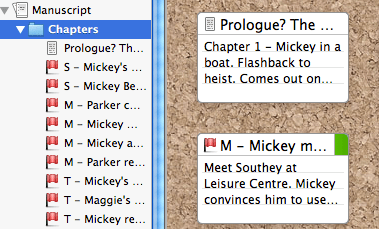 It’s just that, I feel, Scrivener makes it much easier to do. What if I don’t know what the next chapter is? No problem. Because Scrivener lets you create separate documents and drag them wherever you want, you have complete flexibility. Only know the final chapter or scene? Fine – create a document, outline it with a few sentences and write it whenever you like. Know that your main character is going to sleep with a barmaid in a couple of chapters time, but not sure how he gets there? No worries – skip ahead and write that scene. Outline the bits you know – just make sure you always have something to come back to and that you have enough direction to keep the structure of your story intact. It’s ‘Plantsing’ and it works for me. What works for you? How do you get through that first draft without writing yourself down a blind alley or boring yourself to death? Share your thoughts below, subscribe to the blog and follow me on Twitter – I would love to chat. It all makes good sense to me. I hate being a panster but find plotting too stifling, so plantsting might just work! I’m up for giving it a try. Thanks for sharing. Cheers Maria. Pantsing is great fun and if you can write a whole novel that way, then more power to you. Reckon I’m a plantster too. I need some sort of plan to work to (even if I don’t follow it) but not to work out so much detail I feel restricted. Plus I’m a keen gardener and love plants! Ah, the Green Fingered Novelist – has a ring to it! Metaphor still holds too; we plant the seeds but still have to give our little saplings some room to grow. (Spoken like a man who only grows weeds!) Thanks for stopping by, Patsy.